A couple of weeks ago when the World Cup was wrapping up and we were starting to think more about our next part of our journey in Portugal, Wes mentioned that we should go the Azores. The what? I had never heard of the Azores and had absolutely no idea where they were. It turns out that the Azores are a group of nine volcanic Portuguese islands in the North Atlantic Ocean, approximately a 2 hour plane ride from Portugal and a 4 hour plane ride from Boston. We did a little bit of research about the islands, booked flights, found a hostel and next thing I knew we were headed to Sao Miguel. It has been a grand week in the Azores filled with memories that will last a lifetime, but as we continue to learn how to be on the road for an extended period of time I have faced a few ups and downs. Traveling is such a privilege but it is not always a walk in the park. 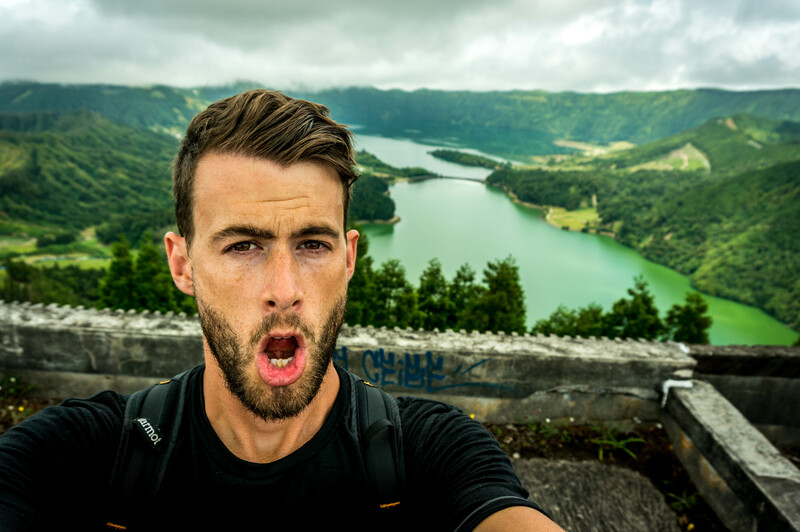 I thought I would share my highs and lows of Sao Miguel…thankfully the highs outweighed the lows and were far more memorable, at least for me! We arrived in Sao Miguel very early in the morning, it was cloudy and just really dreary. We took a small bus to our hostel, realized that we could not check in early and that they indeed did not have any private rooms or mixed dorms. So not only would we not have a private room or our own bathroom, we also would be sleeping in different rooms with complete strangers. Not my idea of fun. But the price was right and everywhere else on the island was quite a bit more expensive, so we decided it was going to be okay. This was a low and I was quite tired from getting up so early. All I really wanted to do was check into the hostel and go to sleep. The second morning in Sao Miguel I experienced my lowest low, which was followed by a very high moment of the week. 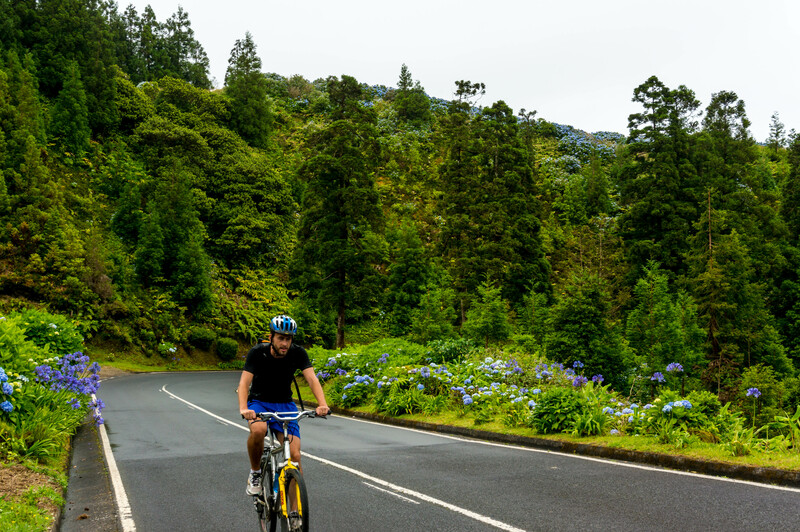 We decided to rent bikes and ride along a coastal road that would lead us to Lagoa das Sete Cidades (twin lakes situated in the center of a large crater). We didn’t get but 15-minutes into the bike ride before I completely broke down crying. I am still not totally sure why…but I think it had something to do with sleeping in separate rooms, being locked out of my room by a girl who wanted to sleep, the nasty corn flakes with warm milk for breakfast, the massive cockroach that was on my bed when I woke up, the cold shower and the no wifi in the hostel (meaning I couldn’t FaceTime/WhatApps my family, friends all week). Wes, as usual, was a true sport. We sat on the side of the road looking out at the beautiful ocean and a little town perched on the cliff above the ocean, and I just cried. I was doubting everything, but specifically if I was truly cut out to travel like this. Eventually I calmed down, came to the conclusion that I most definitely need to sleep in the same the room as Wes (a private room preferably), that we could find wifi other places on the island, that I didn’t have to eat the nasty cornflakes and that we had cockroaches in Oklahoma City and I would survive. We got back on our bikes, road approximately 13 miles and climbed almost 2,000 feet. This leads me to my high. The ride was magical, we road through mist and fog almost the entire way to the lakes. It was quite the climb, but it was beautiful. The road was lined with massive hydrangea bushes, filled with vibrant blue, purple, pink and white flowers. We arrived at Lagoa das Sete Cidades and the clouds started breaking, with spots of sunlight shinning through. Although there is really only one lake, it appears like there are two lakes which are referred to as Lagoa Azul and Lagoa Verde due to their different color. It was sort of difficult to see the two different colors, but wow they were just gorgeous. And the surrounding mountains where so lush and green. Probably the top reason Wes wanted to come to the Azores was to go whale watching and that is what we did on day 3. 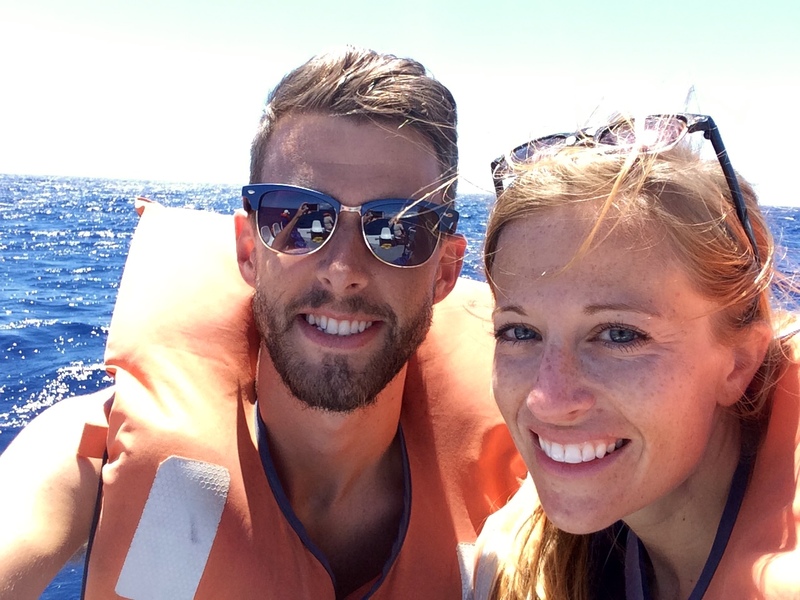 We headed out on a relatively small boat, orange life vests on and a smile stretched across Wes’ faces. The ride on the boat was so wonderful, it was just incredible to look back at the island and see how beautiful and unique the coast line was. Luckily enough we did see a whale, actually a mom and a baby. But to tell you the truth…they looked like large logs in the water, spraying water every once in awhile. Yes, it was incredible to actually see a whale but we really only saw the top fin. At the very end we did see it dive, which was cool. Just being out on the water was probably the high point for me! After our crazy bike ride to Sete Cidades, we decided to rent a vespa (instead of enduring an even more difficult ride) to vista Lagoa do Fogo…another crater lake. We hopped onto the vespa and took off. Although I didn’t know it at the time, Wes was pretty nervous driving at the beginning. We stopped often to compare the very basic map we had of the island to our iPhone GPS. There aren’t many main roads on the island, but we wanted to ensure that we didn’t end up on the highway. I loved being on the vespa! 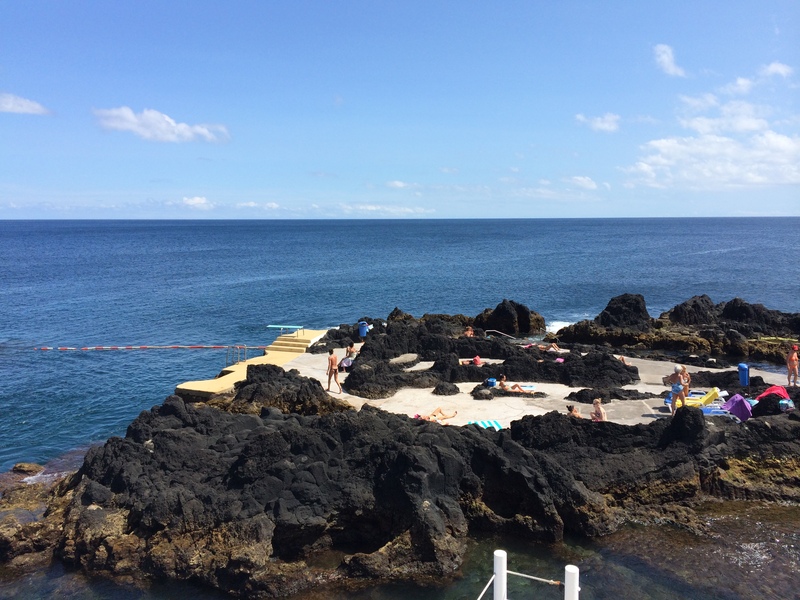 We decided to first stop in Ribeira Grande, a coastal town on the north side of the island. We found a cute little place to eat lunch right on the water with a view of the cliffs and the ocean. Wes ordered blood sausage and pineapple, he managed to finish half of it but not sure he will order it again. We could tell from our view of the mountains surrounding Lagoa do Fogo that it was far to cloudy to drive the vespa up to the lake. Wes was disappointed and we still wish that we would have gotten to see the lake, but the weather just wanted cooperating. So we changed our plans and road the vespa back down to the southern part of the island to another coastal town called Lagoa. Wes and I kind of fell in love with this little town. There was an incredible place by the ocean to swim. Not really sure how to describe, so I’ll just post a picture. The second reason that Wes wanted to come to the Azores was to go swimming with the dolphins. I am so thankful for my husband’s adventurous spirit and drive to do new and different things, because swimming with the dolphins was one of the coolest things that I have ever done. Before heading out on the boat, we received very brief instructions on what we would be doing, put on our wet suits and life vests and quickly used the bathroom. We took a pretty brief ride on a small motorized boat and were quickly surrounded by tons of dolphins, it was quite incredible. Since Wes and I were sitting closest to the back of the boat we were the first to go. We were totally not mentally prepared to jump into the open ocean with a bunch of dolphins, but there was no time to think. The skipper told us to sit on the side of the boat and get our masks on, I panicked a little because mine was all foggy. The boat slowed down and the instructor took my arm and dropped me into the water. Wes and I had no clue that we were supposed to stick our faces under the water to see the dolphins swimming, so we were just kind of floating not knowing what to do. After just a couple of minutes, they told us to return to the boat. Everyone else took a turn and then we got a chance again. This time we were more prepared, we stuck our heads under the water immediately. It was so amazing, we saw the dolphins swimming, jumping and heard them talking to each other. I can’t even really explain the feeling of being in the open ocean and swimming with these beautiful, playful, curious animals. Hands down the highest point of the Azores for me! Wes did end of getting a bit sea sick and hanging over the back of the boat throwing up, but I don’t think it really put to big of a damper on his experience. 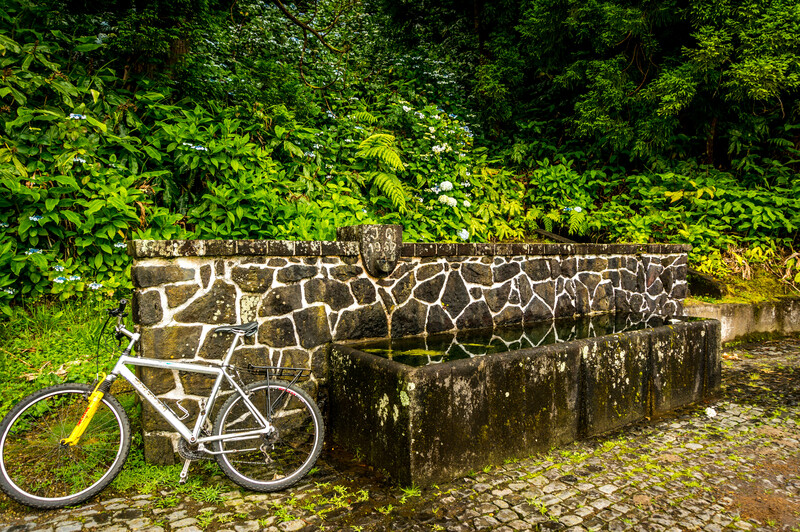 We had 2 other days in Sao Miguel, but what I have shared is the most memorable for me. 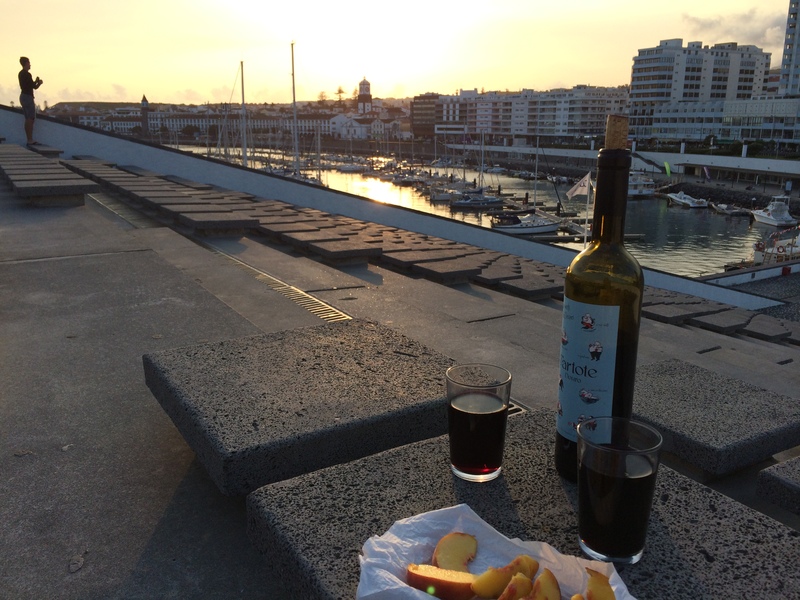 We also had some beautiful sunsets and drank some delicious Portuguese wine…actually headed out soon to enjoy our last sunset on the island. It has been a week that I will never forget, Sao Miguel will always have a special place in my heart. The Azores were almost the end of Wes’s great grandpa during WWII. He was flying a military C-54 transport from the states to the Azores. After they passed the point of no return (only enough fuel to reach the Azores) they got a message that the weather had changed and the visibility was now zero/zero (very thick fog). This meant that there could be no aircraft operations. They had no option but to continue and hope the weather would change. After circling the airport and using most of their remaining fuel they had to land. There was a non directional radio beacon that you could use legally to land if the visibility was 1/2 mile and 300ft vertical. With the engineer and radio operator assighned to look out of the pilots side windows and advise father if they saw any runway lights they landed and stopped. It took the Operations jeep an hour to find them on the runway. when i first read through it and you said you broke down crying I thought Wes was writing this one and it seemed fitting. Loved the video from the Azores, looked amazing! I was there back in July, was a little homesick as well. The place is absolutely beautiful though, a trip I’ll never forget. I noticed in one of the photos you took that you visited the abandoned hotel and the hot springs… Glad to be home but would love to visit again.